We are reliable professionals with over 40 years of experience. We listen to our customers and work with them to address their needs through innovative solutions. You name it and we can provide it. With our experienced staff you can be sure we will get the job done and get it done right. Ralph Nowak (Right) - in charge of rideon & walk behind repairs. You will usually find him at the Kell Lane parking & reception desk. 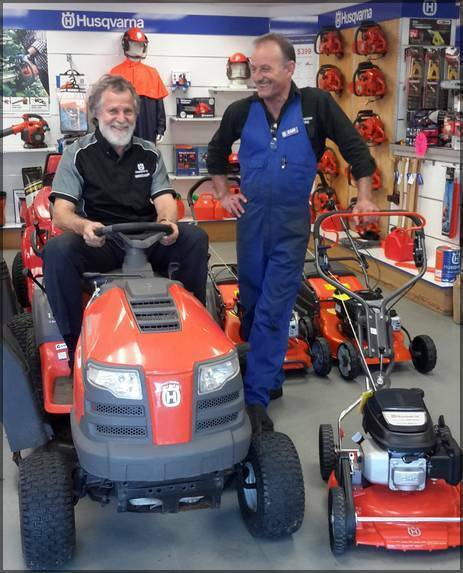 Ross Cato (Left) - Has moved from Wairau Road to the Albany Store - You can reach him 8am to 5pm on 0800MOWER4U. for any machinery inquiries. Robin Humphreys (Proprietor) - Has taken over the Wairau Store - You can reach him 8am to 5pm on 0800MOWERS. for any reason - the buck stops here!